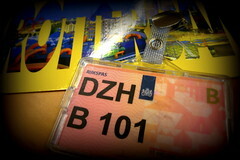 Earlier this year I was working in Rotterdam, a city I had never visited before. 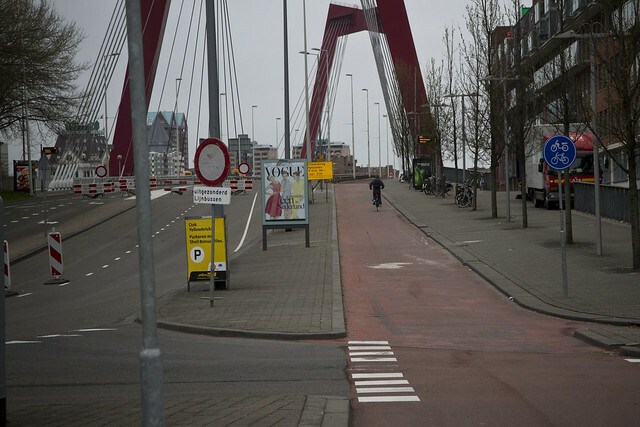 You get the impression from Dutch people in the rest of the Netherlands that Rotterdam isn't really Dutch. 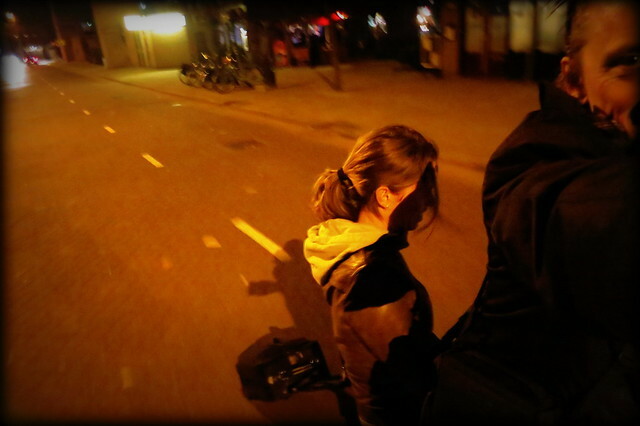 Generally, the attitude is that Rotterdam isn't very cool. The only way to figure it out is to go there. But soon realised that it was a golden pass to the entire Kingdom of the Netherlands that would get me free beer and cheese and... uh... bouquets of tulips. Just coffee and lunch, but hey. 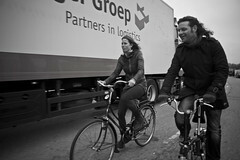 Copenhagenize Consulting was hired by De Verkeersonderneming, a consortium of partners aimed at improving traffic conditions in the city. 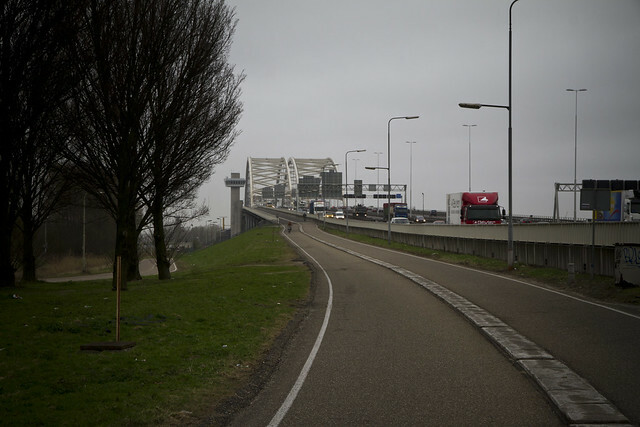 The partners include the City of Rotterdam, Rotterdam Metropolitan Region, the Ministry of Transport, Public Works and Water management and the Port of Rotterdam Authority. 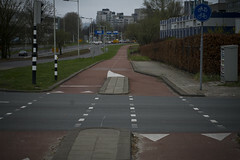 Rotterdam felt Dutch to me. Sure, the city centre with it's modernish skyscrapers and the massive river lends a mid-Atlantic feel to the place, but it wasn't some alien planet like people from other cities would lead you to believe. 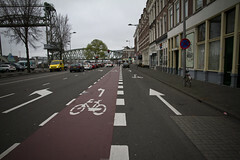 Although De Verkeersonderneming has a bike campaign called I do it My Way, which hints at New York. There were still more bicycles parked at the central train station than are on the roads in, say, Australia at any given time of day. 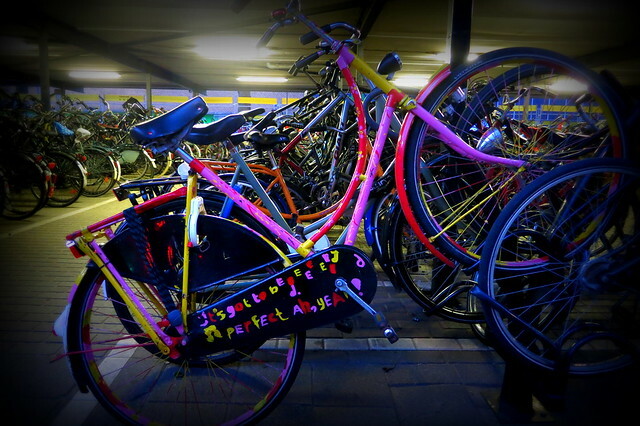 Parking was the same as everywhere else in the Netherlands. The same wonderful Supermums were out and about. 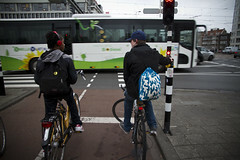 The people with whom I shared the cycle tracks looked the same. 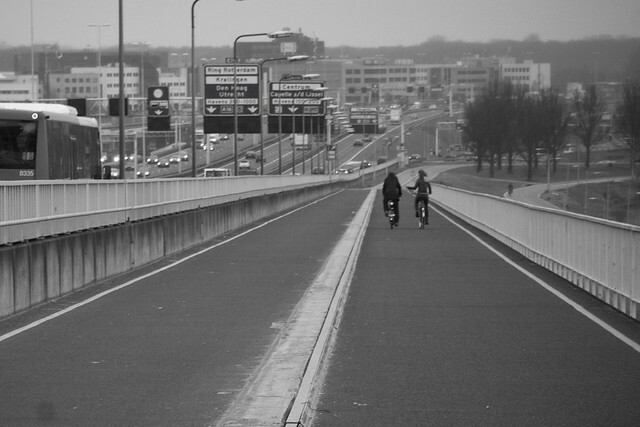 As did many of the cycle tracks and they also have a new, funky bicycle bridge (bottom right). 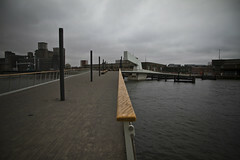 They are also crowdfunding a spectacular bridge in the city, Luchtsingel. Which has nothing to do with this article... it's just damned cool. There were some weird infrastructural abberrations, but fortunately not too many. There are, however, bridges. Lots of them. King-size bridges compared to many cities. 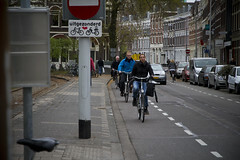 All of them with bicycle infrastructure, of course. The city felt alot like Copenhagen in a way. 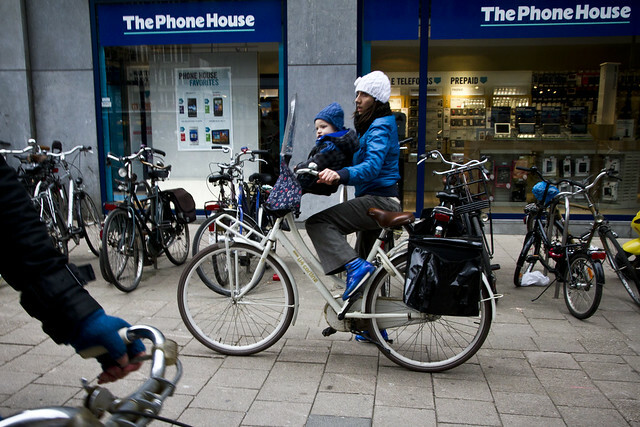 Cycle around the centre of Amsterdam and you feel like your're in a wonderful bicycle anthill. 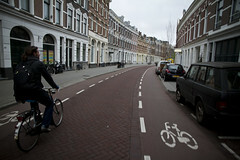 Amsterdam is, because of it's layout, Amsterdam and there will never be another city like it. 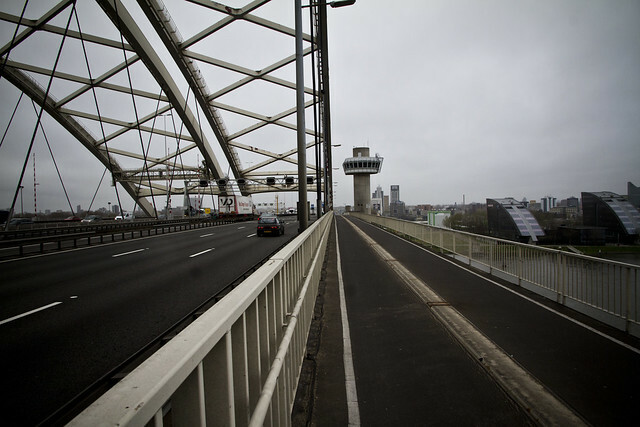 With bridges and motorways and the river, Rotterdam is a distant cousin to Copenhagen. 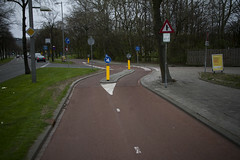 Cycle tracks everywhere (although with some crucial missing links in the network that priortize cars) and a relaxed feeling on the cycle tracks. 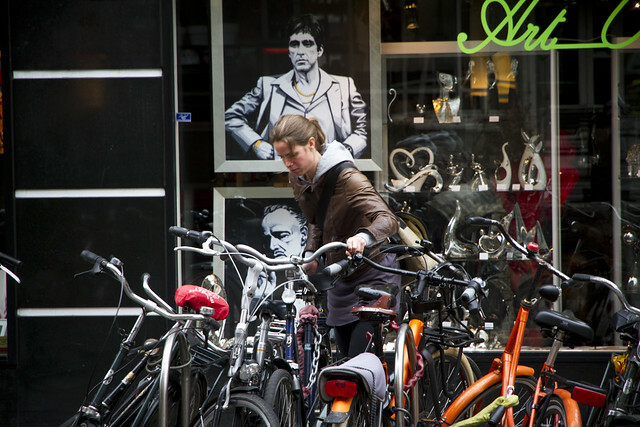 If you go to the Netherlands, experience the quintessential Dutchness of most cities. But go to Rotterdam, too. Just to see how a big, "mid-Atlantic" city does things. Whether or not they will move forward based on the brainstorm is up to them. But the potential for the city is massive, given the right political will and the desire for changing to a New Millenium, designed city for people instead of cars.